Salvus Lidsun - Salvus was one of the major news reporters in the RAU before Christopher Paladin came along. Even after Chris earned a spot there, I continued to use Sal until the end of the series. When Sal was in sketches aside from the news, his "schtick" was that he tried to be scary, but no one was actually scared of him. He's a combination of a wolf and a bat. Samantha - A mysterious, plainly-dressed girl that Desiree's pirates found wandering around alone. She carries a single golden glove that they wanted to steal, but when they tried, Sam kicked all their asses, as she's rather accomplished in martial arts and unusually strong. Sam doesn't seem to have too many memories of her past, but Desiree was impressed with her fighting skills, so she let her join the Quixotic Tigers. But after a chance meeting with Christopher, Sam decided to leave her life of crime. Eventually, when Ghestov and his minions came after her, the truth about her past was finally revealed - she's an android created long ago for some purpose relating to the Seven Towers. Being a synthetic human, Sam is lacking a sense of humor, but she does seem to have emotions. She's handy with computers and other technological gizmos and she is very helpful when needed. 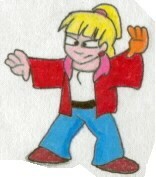 Although Chance and the others initially worried about her ability to go against her programming, Christopher refused to give up on her. Upon seeing that he still cared about her, despite her unintentional deception, Samantha realized where her true place in the world was and abandoned her pre-programmed mission. Sam is so strong and resilient that she does not need to use any kind of weapon, although she does carry a single golden glove. The glove was actually a device needed to operate something in the towers, but it can be utilized as a weapon, too. Her date of creation is unknown, but it is obvious that she was built to resemble (and maybe act like) a girl between 15-17 years of age. Scry Salvadore - Scry was a character I created for The Minerva Project and was supposed to be a long-time friend of Christopher. He was one of the few survivors of the Aridian Apocalypse caused by the Elemental Lord of Fire, Karma. He had been living there to study at the Aridian University, but after the tragedy, decided to return home to Arkantos where he'd join Zara's military. However, he began to realize how corrupt Zara and his forces were and broke off to form a small group of rebels fighting against them. Scry has some charismatic leadership skills and his righthand helper is a chaotic cat named Wildclaw who sports a bandana and totes an AK-47. When he is reunited with Christopher, he recognizes him as the "true prince of Aridia" and wishes for him to help out with his cause against Zara. Serpentina - A lamia that can turn people to stone. She is a direct servant of the Elemental Lord of the Earth, Beorthe. Sesa Markino - Sesa is the best friend of Chance Tomasaro. They had grown up together in the town of Phoresta on the eastern Nispatian continent. Like Chance's father, Sesa's father was also a famous hero, but Sesa doesn't quite live up to expectations. He doesn't concern himself too much with the troubles of the world, and had even once joined Desiree's pirate gang while traveling around. 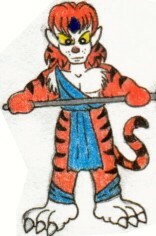 He eventually quit the pirate life, but he still wears their trademark orange tiger scarf, and he continues to have an undeniable crush on Desiree. He has been to many parts of the world and knows much about it. He likes to daydream about women and other stuff, even when he should be focused on more important things, but he can be clever if he puts his mind to it. In fact, he's somewhat of a "closet nerd", which is probably due in part to the fact that his father was an inventor/scientist. Sesa is one of the characters who is haunted in his dreams by Seth, a spirit that is trapped in the dream world. It's possible that Seth can communicate with him because Sesa has untapped psychic powers. Sometimes, his dreams are precognitive. Other times he knows something is going to happen a moment before it does. He can directly read a person's mind by touching them, and occasionally, he's able to read thoughts out of someone's mind without physical contact. Despite all of this, he doesn't seem to take his powers of precognition too seriously, and brushes them off as minor coincidence. He is also a vegetarian and wears reading glasses. 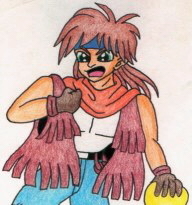 Sesa is one of the more "relaxed" members of Chance's group, which is both a strength and a weakness to his character. It's a strength because his mellow attitude is often needed to mediate the chaotic nature of the group's chemistry. It's a weakness because he sometimes seems like he doesn't have much of a personality - a problem I've been trying to work on without resorting to character clichés or making him a complete self-parody (like he was in the RAU). Sesa's weapon is the Crystal Boomerang, an item of mysterious origin that he's learned to wield with deadly accuracy and efficiency. He is about 21 years old. Seth - Seth is a specter that is trapped in the dream world. He can sometimes communicate with living people through their dreams. Although his "normal" appearance is that of a man split down the middle like a yin-yang, he can assume many different forms, including a shadowy nondescript figure, a ghostly reaper, and even a dragon. It is believed that Seth may have been a human who was killed when fighting against the Elemental Lord of Dreams, Droma. Droma then trapped his spirit in the dream world for defying him. It is not known if Seth's intentions are good or bad, but it is most likely that he is trying to find a way back to the real world. He has an owl that rides on his shoulder named "Spyre", and the fox-like daughter of the Dream Spirit, Victoria, is his friend. Seth's weapon depends on his form. He sometimes throws discs that are "painted" like yin-yangs, sometimes he has a scythe, and other times he just shoots out a wavy beam of energy. His age is unknown. Shaddah Paladin - Arrogant king of the Desert Elves, father of Christopher Paladin. Nucleo, Image Arcane, and Stefan all worked in his court, but he betrayed them out of his distrust and dislike of them, and conspired with the Elemental Lord of Fire, Karma to have them all killed. His plan, however, backfired when Karma reneged on the deal and wiped out ALL of Aridia. Christopher never got along with his father, so he ran away. 'Cleo had a lot of moral difficulty working under this guy because he didn't agree with a lot of his methods and opinions, and especially his chauvinism. Shaddah's father was a great king who had turned the Aridian Kingdom into a paradise for all species - this explains why there were many different races besides desert-elves present, and why Nucleo, Image, and Stefan, who would have been considered "undesirable" in many other places, were able to get jobs there. But Shaddah was paranoid and oldschool - he believed in purging the city of all creatures that were not desert-elves and thus was easily manipulated. Karma had specifically asked Image Arcane to be sent to the Fire Tower as a sacrifice, and he would help Shaddah in return by granting his wish. Karma purged them, allright...along with everyone else, too. Shaddah tricked 'Cleo and Image into going by telling them it was archaeological expedition that he would fund. 'Cleo, who hadn't been on an expedition in years because he was too busy teaching schoolchildren, was more than happy to take the job, unaware of the danger it posed. Shaddah's weapons were a silver sword and shield. The Silver Sword had two extra blades attached to the hilt that were situated just to the left and right of the main blade and were only about half as long. He was about 36 years old when he died. Shadow - Female ninja bird. I do not know for what purpose this character was created, except that it looks as though she could have easily been one of the avian minions of Aira, the Great Sky Spirit, esepcially since her sword appears to have a lightning bolt going through it. Shadow currently has no role in Image Arcane. Shnoo - Little white bird-like creatures that wield swords and live all over the world. They are generally friendly, and sometimes even helpful, so long as they are not mistreated or provoked. These only existed in the Minerva Project, although I have several pictures of them alongside Image Arcane characters in pieces of conceptual art. Shnoos are used with permission from creator SethraShnoo. Skiva - Skiva is the Lord of Balance, and essentially the ultimate Great Spirit. It is believed that her presence in the world of Phainein is what kept the other elementals suppressed for years. But a millenia of battling Cynoss, and the Great Cataclysm that ripped the world apart, weakened her...enough that she was defeated by Cynoss. The Image Arcane Sword, aka the Sword of Skiva, was forged from her blood and bones. Because it was made from her, it was powerful enough to repel all the other Great Spirits (with the exception of Cynoss). Some of Skiva's spirit remains in the sword, and it practically has a life of its own, sometimes refusing to commit immoral acts by attempting to pull itself out of the wielder's hands. The sword once came into possession of the demon-elf Image Arcane, who engraved her name onto it. It later fell into possession of Hirochi Tomasaro who passed it down to his son, Chance. Skwirl - Strange little squirrel-like creatures that bounce around on their two legs. 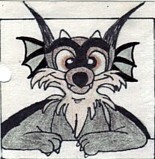 These guys were sometimes used as background animals in both Image Arcane and the RAU. Snakeroot - Snakeroot was once a humble, though bizarre-looking, mutant snapdragon. He merely wanted to find a quiet place to live where he wouldn't be attacked by humans or other monsters, which led him to the Nispatia Tower. Once inside, he was immediately possesed by Spectre, the Great Plant Spirit, and turned into an elemental lord of destruction. He slept for many years, gathering up energy, but was awoken when Darkona sent the possessed Nucleo McRaven to take the tower from him. Snakeroot was brought down with the Image Arcane sword, which drove Spectre from him and returned him to normal. Grateful for being saved and spared, he took up residence in the garden behind Chance's inn where he tends to the plants and helps them grow. Chance was initially worried that Snakeroot would eventually eat him or one of his friends, but SR has actually proven to be a trustworthy friend, gardener, and watchdog. Snakeroot uses various different weapons. He has an axe, a sword, a vine with thorns that he sometimes carries around his neck, and a giant "hobo" pouch on a stick that's full of healing herbs. His age is unknown. 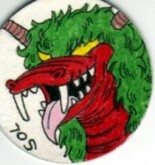 Sol - Sol is the Great Red Dragon that terrorizes the continent of Aridia. It appeared sometime after the Aridian Apocalypse, and it is the direct servant of Karma, the Great Elemental Lord of Fire. Karma once set Sol on a mission to find and conquer more of the towers. This led Sol to the continent of Nispatia, where Chance's father, Hirochi, defeated it in battle. Although Hirochi succeeded in badly injuring Sol, it was not dead. Instead it returned to the Fire Tower in Aridia to hibernate until it was healed. Hirochi found a strange sword while fighting this demon unlike any he had ever seen before, but the sword seemed unusable as a weapon. Song Savis - Song Savis was a minor character in Image Arcane who was both a falconer and a powerful sorceress. Rostrahmus is her loyal tamed falcon. This notebook doodle is the only picture of these two I could find in my archives. She also has a friend, a strange levitating girl, named Taura Asa. Song and Taura have opposite personalities, but still get along very well. Song tends to be cautious and cynical about the world, whereas Taura likes to dive into situations head-first. It seemed from the script that these two were involved in that Song was a caretaker of sorts for Taura, treating her as a little sister, perhaps because her parents weren't around anymore. Song also seemed to be the one and only potential love interest for Chance, although nothing ever became of it. In addition to her falcon friend, Song also had a crossbow. Her exact age was never determined. I imagine she was about 20-25 years of age. Spectre - The Great Elemental Spirit of Plants. Spectre controls the Nispatia Tower that lies within the Dark Forest near Chance's hometown. He is the one responsible for possessing Snakeroot and turning him into a monster of formidable strength and size. Unknown to Chance, Spectre had been causing the water in the wells and soil of Nispatia to dry up, forcing many people to leave and turning his village into a ghost town. Although still a dangerous threat, Spectre was one of the least powerful of the Great Spirits and was defeated with the Image Arcane sword. Spyre - An owl that rides on the shoulder of Seth, the dream spectre. He appears to be a very minor minion of the Dream Lord, Droma, yet is not malicious. However, his appearance changes constantly. He almost never looks the same way twice. Sometimes he is brightly-colored and almost cartoon-like. Other times, he looks darker and more sinister. It is believed that the appearance of Spyre indicates the nature of the dream he and Seth appear in. If he looks cartoony and friendly, the dream is a good one. If he appears in his darker form, it will be a nightmare. Starla Wildflower - A young girl that Jack rescued from Grimms (small gremlin-like creatures) in the Dark Forest of Nispatia. Jack tried to lose her afterwards, but she was fascinated by him, having never seen a Waterlily Dragon before. She tried to follow him, but ran into Nucleo, whom she mistook for another Grimm because of his bizarre appearance. In one of the most hilarious scenes in IA, she grabbed a tree branch and proceeded to beat the crap outta' the poor old professor. Soon after though, she apologized for her brutality, to which his response was, "Oh, that's nothing compared to what Cory does to me when she gets mad!" The script for this episode was never completed, as I was working on it around the time I quit writing. Starla currently has no role in Image Arcane, but I might work her in eventually. She was meant to be sort of a "love interest" for Jack. You see, Jack was always getting on Chance's case for his prejudices against non-humans, but it turned out that Jack had some prejudices of his own when he realized he couldn't return Starla's love because she was a human and not a waterlily dragon like him. This episode was supposed to force Jack to deal with this irony, but I never finished it. Besides the initial tree branch that she used to wallop Prof. McRaven, Starla was eventually given one of the spear-like weapons from Chance's dojo, which she mysteriously was able to wield quite well for someone of her age with (supposedly) no training. She is about 13 years old. Stefan Ferguson - Stefan was once a kind-hearted priest, but the harsh ways of the world made him despondant and lose his faith. He joined Ghestov sometime after the Aridian Apocalypse, in which he was thought to have been killed. Although he had very strong faith at one time, he was treated like an outcast and mistrusted by many because of his ability to change into a fearsome demon-like form. When the Seven Towers malfunctioned hundreds of years ago, the resulting cataclysm ripped the world apart and caused various mutations amongst many lifeforms. Stefan's alternate form, which runs in his family, is believed to be one such mutation. 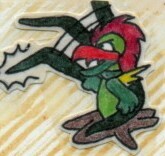 He has large retractable blades embedded in his arms in both forms. (It is most likely that his specific mutation is genetic evolution caused by the Earth Demon, Beorthe.) He was once a friend of Nucleo and Image Arcane. Stefan is obsessed with killing Christopher because he blames the Paladins for the tragedy in Aridia and will not risk seeing another one ascend to power (even though Christopher is nothing like his father and has no interest in the throne, anyway.) 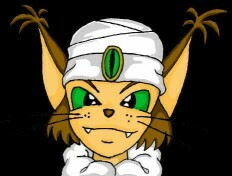 Although 'Cleo is shocked to find he is alive and working for the enemy, he believes that Stefan is not truly bad and the good priest who was his friend still exists. Stefan's only weapons are his armblades, which he uses quite effectively for both attacking and guarding. He is about 55 years old. Swan - The Great Elemental Spirit of Water. 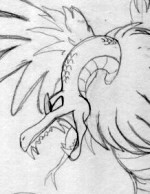 Swan appears usually in the form of a giant serpent/dragon/bird hybrid. 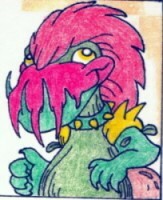 His minions are the waterlily dragons. Unfortunately for him, Swan got the short end of the stick when the elemental spirits took over the towers years ago because his tower, the Water Tower, is dilapidated, badly damaged, and on the verge of sinking into the sea. Since Swan was not able to harness much energy from the tower, he was defeated by Zara's beast army, and his waterlily dragons were nearly wiped out. He pooled as much concentrated magical energy as he possibly could into a crystal ball that is now in the possession of Jack Sheen. Jack had gone to see Swan for help in defeating the fire demon, Karma, but upon getting too close to the Water Lord, he started suffering the same kind of seizures that Nucleo did when he was too close to Darkona. Somehow, Jack's loyalty to his friends and willingness to sacrifice himself for them convinced Swan to join their cause. After his travels with Chance's group, he admitted that he was impressed with the comraderie amongst creatures that were essentially born to hate each other and decided that perhaps forcing them to fight one another for a dominant species was a cause not worth fighting for. Swan, the once cold and vicious viper, finally understood the true power of the human spirit.